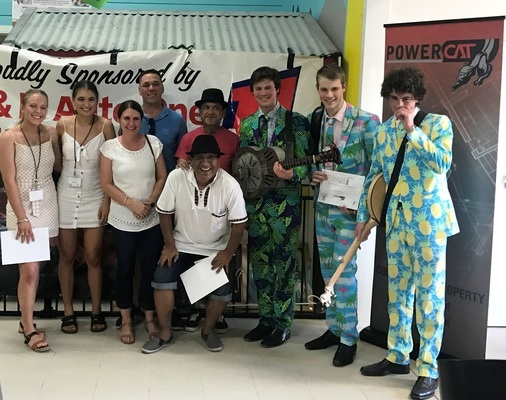 The winners of the Open Category of the 2019 Stanthorpe busking Championships are pictured with major sponsors Stephen and Sandra Kay of Powerecat. From left are duo Laura and Claire (third), the second-placed Pan Pipers Otra Vez, sponsors Stephen and Sandra Kay and the open winners The Inadequates. The boys in polyester, The Inadequates, wooed audiences and Judges alike during the 2019 Stanthorpe Busking Championships last Saturday 23 March. The Inadequates perform during the finals concert in the Alley Arcade and not only won the Open Championship but were also named Best Band, sponsored by Sam’s Fresh Fruit and Vegetables, and they won the People’s Choice Award. The trio will now go on to compete in the finals of the Australian National Busking Championships in Cooma in November.